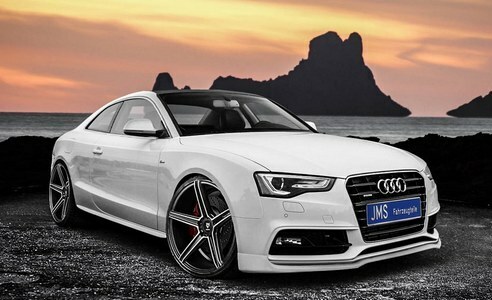 The German tuner JMS highlights its last program on the Audi A5, a program that follows the latest proposals already delivered by the tuner as well on an Audi A6 that Opel Astra GTC or even Audi A3. No surprise waiting for this offer, a program already enjoyed in broad widths as explained in the introduction. On different models of A5 family, we can dissect front bumper, lip, rear diffuser and even different models of 20″ rims and 255/30 tires. Note also lowering springs kits for low ground clearance of 45mm or stainless steel exhaust original Eisenmann consists of four line outputs.